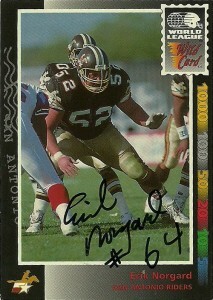 Young offensive lineman Erik Norgard was signed by the Houston Oilers as a free agent in 1989. A gem in the rough, at 6-1, 290, Norgard posessed the size, strength, and mobility, to play any position on the line in the Oilers’ run ‘n shoot offense. After he sat out his whole rookie season due to injury, Norgard was assigned by the team to the World League Allocation draft for 1992. The San Antonio Riders stuck him right into the starting lineup and he’d play at guard blocking for Ivory Lee Brown. It paid off as Brown would lead the league in rushing yardage behind Erik and the team plowed ahead to a 7-3 record. After the dissolution of the WLAF in 1992, Norgard returned to the Oilers, starting four games in 1993, and seven in 1994, before returning to being a key backup offensive lineman for the team. He’d move with the team to Tennessee in 1997 and play there through 1998. In 1999 he’d sign with the New York Jets and retire soon thereafter. Over 9 seasons and 108 contests, Erik caught 2 tackle eligible touchdowns, and started 12 games in the NFL.